HARWICH, Mass. -- After compiling a won-lost record of 27-16-1 and setting a league home run record in the process, the Harwich Mariners proudly accepted the Cape Cod Baseball League East Division championship trophy during pre-game ceremonies Thursday night at Whitehouse field. Led by CCBL Curran Manager of the Year Steve Englert and league MVP Phil Ervin, the Mariners finished five points ahead of second place Yarmouth-Dennis and broke the long-standing home run record of 59 home runs belted by Orleans (using aluminum bats) in 1981. Eric Jagielo (Notre Dame)'s two-run homer brought the Mariners total to 60, breaking the regular season homerun record, held since 1981 by Orleans (using aluminum bats). Ervin captured top player honors by batting .321 with 11 home runs and 31 RBI, while Jagielo smashed a team-leading 13 homers, along with a .280 average and 29 RBI. Stanford slugger Brian Ragira hit nine round-trippers to go along with a .235 avg., and 19 RBI. The Mariners have been members of the Cape League since 1930, when the team first began in Harwich. During the league's modern era since 1963, the team has qualified for the playoffs 10 times. Their first appearance occurred in 1968, when Harwich dropped the championship series, 3 games-to-1 to Falmouth in what would become the first of the Commodores’ four consecutive titles between 1968-71. Harwich qualified for the playoffs three times in the 1970s, reaching the championship series in 1978-79, losing both times in four games to the Hyannis Mets. Finally, in 1983, Harwich broke through, winning their first Cape League championship in the modern era. The Mariners eliminated Hyannis, two games to one to earn a berth in the championship series. Harwich prevailed over,top-seeded Cotuit in five games, taking the series, 3-2 to win the crown. 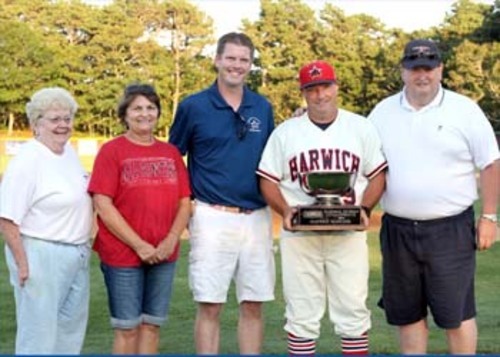 Harwich captured the Cape League championship in 1987 after finishing the season with the best record in the league. The Mariners defeated the Yarmouth-Dennis Red Sox, 2-1 to win their second league title in five years. The Mariners saw little success after winning in 1987, qualifying for the postseason only once in 1997 when they were swept by Wareham in the championship. After an eleven-year play-off drought, the Mariners won the Cape League title in 2008, with a two-game sweep over Cotuit. The Mariners swept Falmouth last season to win their second championship in four years.